“Do you reaffirm your renunciation of evil and renew your commitment to Jesus Christ?” (Book of Common Prayer, p. 292). A mini catechism used at baptisms and on Easter and other special occasions, the Baptismal Covenant opens with a question-and-answer version of the statement of faith that is the Apostles’ Creed and adds five questions regarding how we, as Christians, are called to live out our faith. “Blessed Lord, who caused all holy Scriptures to be written for our learning: Grant us so to hear them, read, mark, learn, and inwardly digest them” (Book of Common Prayer, p. 236). “It is a most invaluable part of that blessed ‘liberty wherewith Christ hath made us free,’ that in his worship different forms and usages may without offence be allowed, provided the substance of the Faith be kept entire” (Book of Common Prayer, p. 9). The Book of Common Prayer is a treasure chest full of devotional and teaching resources for individuals and congregations, but it is also the primary symbol of our unity. We, who are many and diverse, come together in Christ through our worship, our common prayer. “It is a commentary on the creeds, but is not meant to be a complete statement of belief and practices; rather, it is a point of departure for the teacher” (Book of Common Prayer, p. 844). Offered in a question-and-answer format, the Catechism found in the back of the Book of Common Prayer (pp. 845-862) helps teach the foundational truths of the Christian faith. “The Creeds are statements of our basic beliefs about God” (Book of Common Prayer, p. 851). 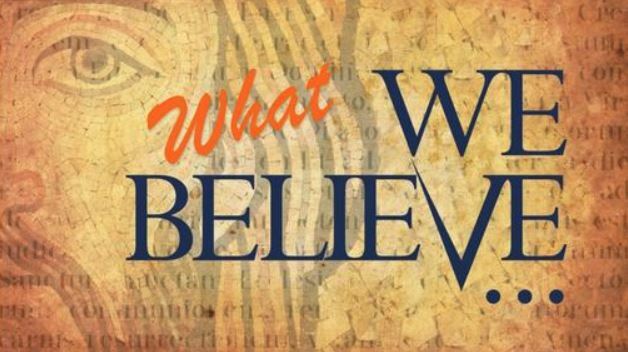 We will always have questions, but in the two foundational statements of faith – the Apostles’ Creed used at baptism, and the Nicene Creed used at communion – we join Christians throughout the ages in affirming our faith in the one God who created us, redeemed us, and sanctifies us. “Holy Baptism is full initiation by water and the Holy Spirit into Christ’s Body, the Church” (Book of Common Prayer, p. 298). The Rite of Holy Baptism can be found on pp. 297-308 of the Book of Common Prayer. “We thank you … for assuring us in these holy mysteries that we are living members of the Body of your Son, and heirs of your eternal kingdom” (Book of Common Prayer, p. 366). It goes by several names: Holy Communion, the Eucharist (which literally means “thanksgiving”), mass. But whatever it’s called, this is the family meal for Christians and a foretaste of the heavenly banquet. As such, all persons who have been baptized, and are therefore part of the extended family that is the Church, are welcome to receive the bread and wine, and be in communion with God and each other. “Sacraments are outward and visible signs of inward and spiritual grace” (Book of Common Prayer, p. 857). These help us to be a sacramental people, seeing God always at work around us.